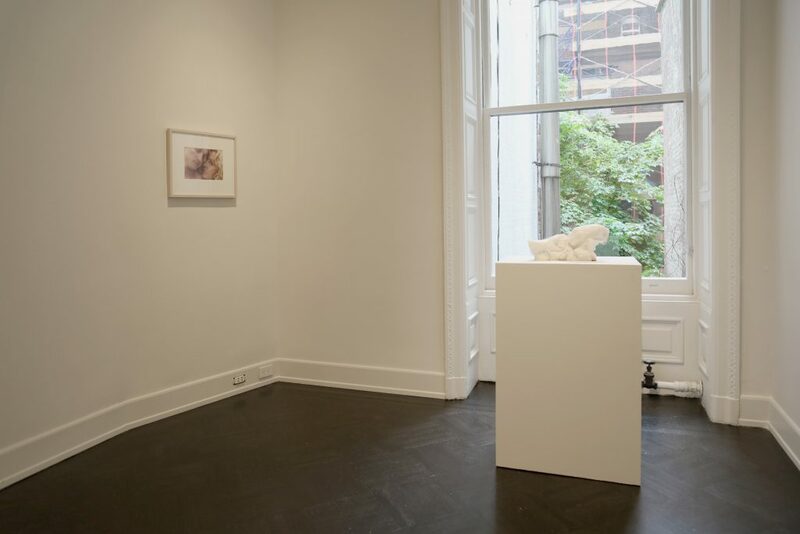 Petzel Gallery is pleased to announce Mother Mold, a survey exhibition of sculpture by Keith Edmier. Ranging from Edmier’s earliest works, such as I Met a Girl Who Sang the Blues (1991) through Imagines (2017), Mother Mold presents a selected overview of Edmier’s work from the past twenty-six years. This will be the artist’s sixth solo exhibition at the gallery and his first in our Upper East Side location. 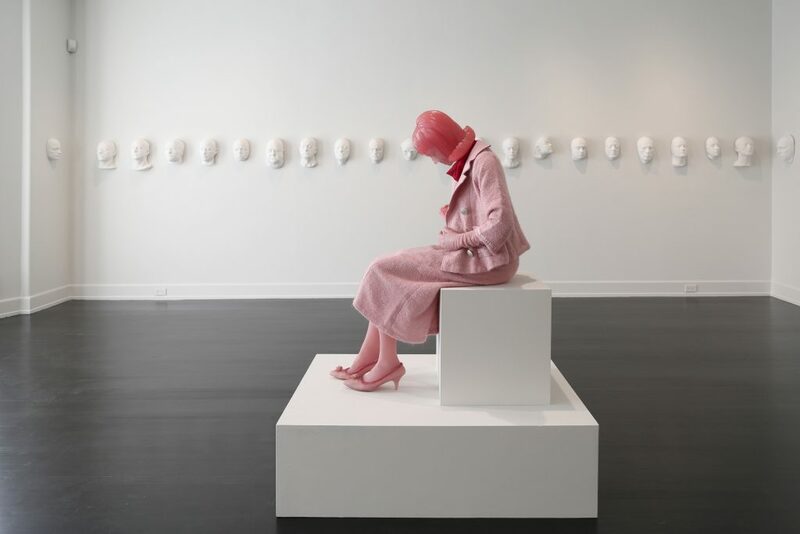 The exhibition is accompanied by a publication that details his most recent installation, Imagines, a set of fifty life-cast portraits hung throughout the gallery space. The title of the exhibition ‘mother mold’ is a term related to the process of mold making. Physically, it is essentially a hard shell, traditionally made of plaster. The shell supports a flexible rubber mold that helps the negative impression retain its shape during the casting process. The shell is a perimeter—an encasement for the transformation of material from liquid to solid and in composition, from abstraction to mimesis. 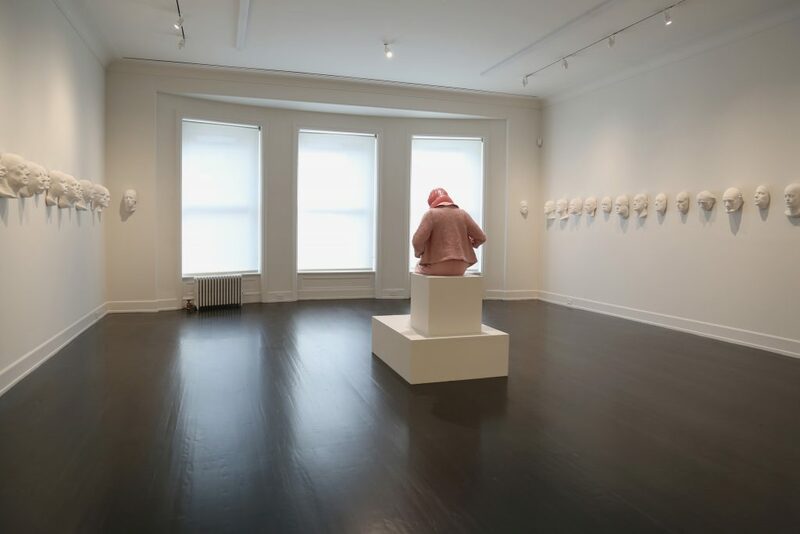 The majority of Edmier’s work from the past twenty years plus have been made through mold-making and casting a variation of industrial materials: plaster, aluminum, dental acrylic, plastic, glass, resin, polyurethane, basalt. Edmier has employed non-traditional materials that purposely interfere with each sculpture’s verisimilitude. Throughout his career, the artist has continued to mold his personal narrative into universal subjects that further transform the objects, solidifying themes of autobiography, eroticism and mortality. Two of the earliest works in the exhibition mines Edmier’s childhood. 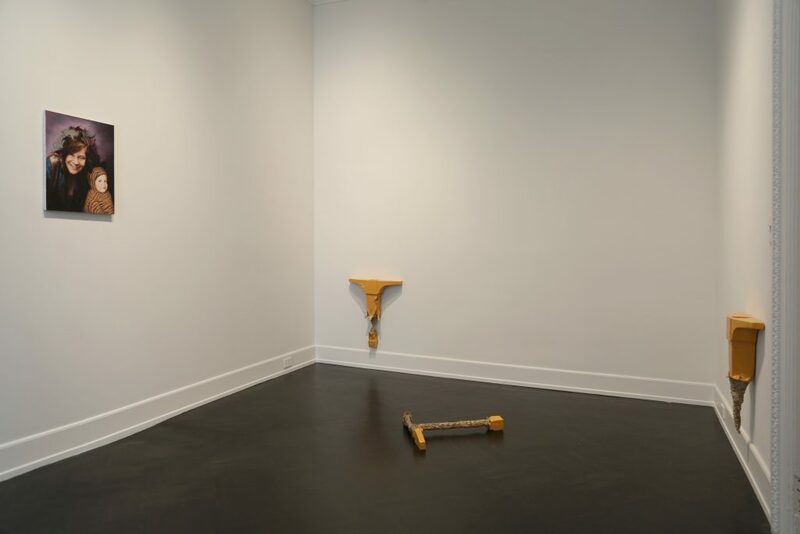 Piano Legs I–III (1992/3) is a set of dissembled golden-yellow piano legs cast directly from a baby grand. The fabricated legs are gnawed away like a tooth-worn No. 2 pencil. The objects had been conjured through a “screen memory” that partially recalls at age three in 1970, tearing apart a gift of a toy baby grand given to him by his father. I Met a Girl Who Sang the Blues (1991), is an oil painting that composites a portrait of the young artist as a child with Janis Joplin. Both portraits are from 1970—Edmier in his striped Halloween tiger costume and the smiling singer the year of her drug overdose and death. Thirty-one years later, the artist would be working in collaboration with the actress Farrah Fawcett. The artistic collaboration upends the role of model and muse, memorialized in an intimate portrait of their hands intertwined entitled Untitled (Hands) (2000), finished in carved alabaster. One can read both muse and matriarch into the phrase ‘mother mold’ as well as conception, pregnancy and birth. In the case of the Annunciation Lilies (2013), Edmier has sculpturally appropriated the lilies and vases from specific Renaissance Annunciation paintings. The ubiquitous flowers cast in pale dental acrylic and polyurethane traditionally act as a gate between the Mary and angel, symbolically standing for the mother’s virginity. Central to the exhibition is Edmier’s sculpture Beverly Edmier, 1967 (1998). 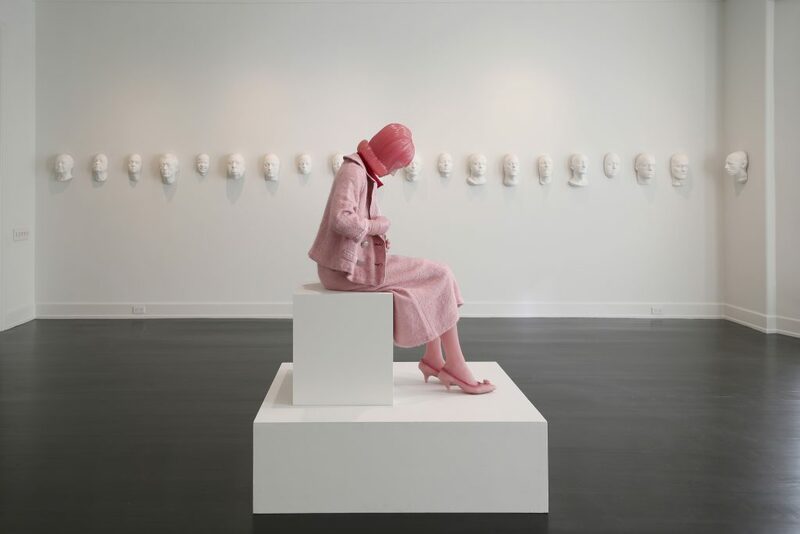 Cast in candy-like pink translucent resin, Beverly Edmier is a life-sized sculpture of the artist’s mother as she was at twenty-two years old and nine months pregnant with the artist. Caressing her womb with her right hand, she gazes down at her belly in an intimate early exchange between mother and son. 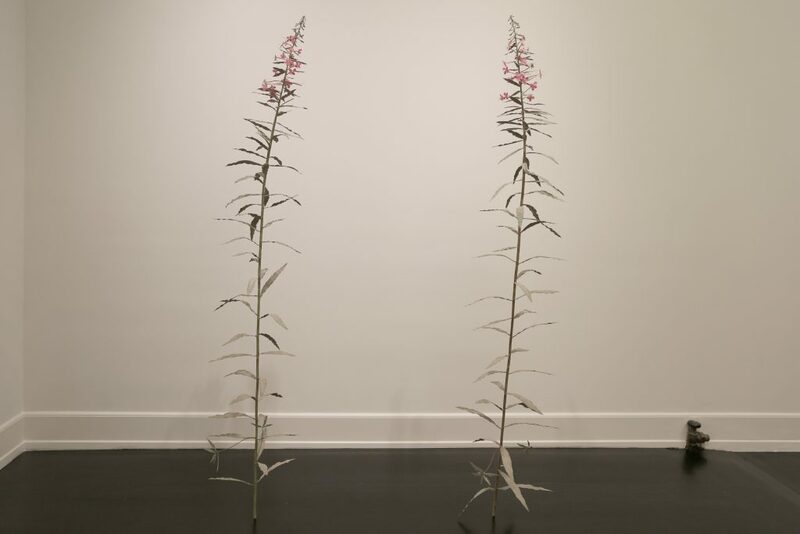 The botanical sculpture Fireweed (2002/3) is an act of biological renewal. The plant, Chamaenerion Angustifolium, is known to be the first to grow after a forest fire, or in this case a volcanic eruption. 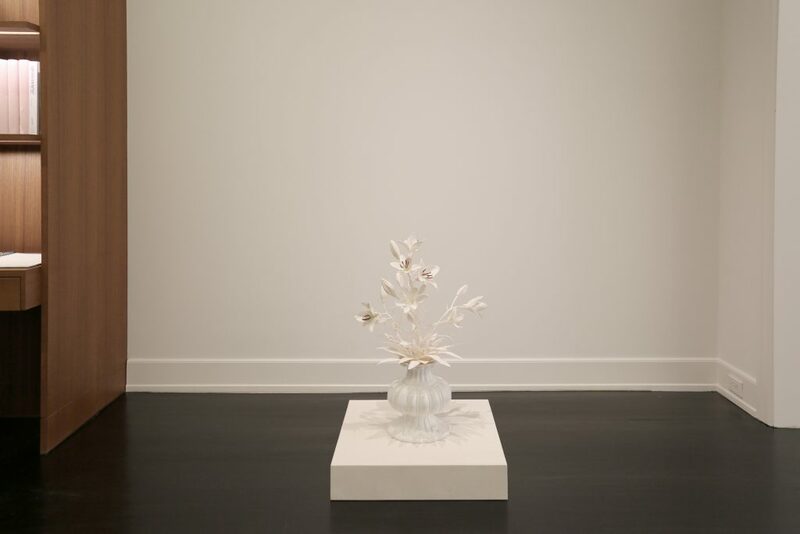 The delicately cast acrylic leaves and flowers are lightly dusted with volcanic ash from the Mount St. Helen’s eruption in 1980, the same year of the artist’s burgeoning adolescence. 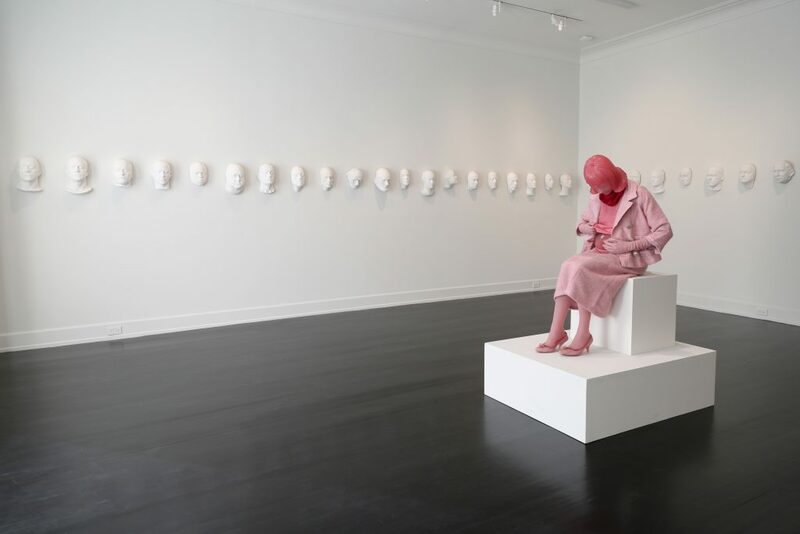 The installation Edmier imagines (2017) is fifty life-cast portraits displayed like the ancient Roman masks known by the same title. One portrait is hung for every year in the artist’s life, with four self-portraits of the artist at different ages. The Roman Imagines were masks life cast of the family passed down through generations. Edmier’s cast portraits connect in familial ways: they portray the artist’s family, friends, heroes and influences. 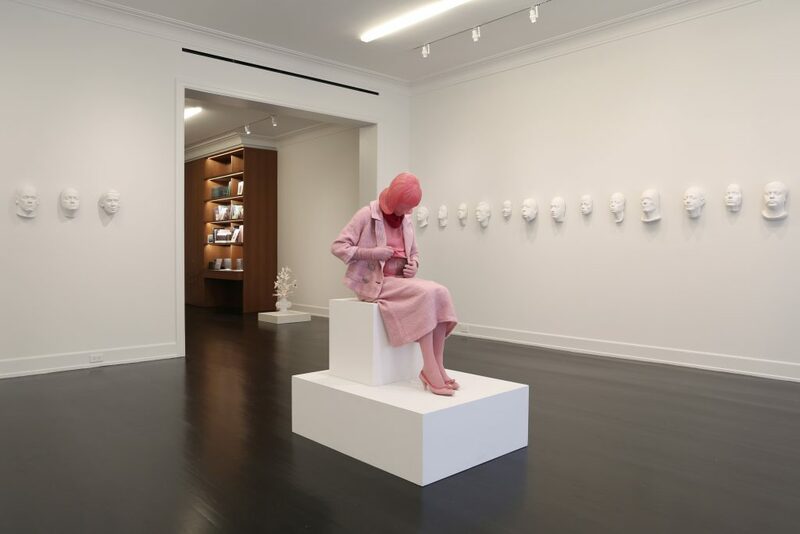 Yet, rather than masks of the dead worn by the living, Edmier’s plaster cast portraits stem from the artist’s years in the Hollywood special effects industry. The connection to Hollywood turns the permanence and memorial of the mask into a starting point for transformation to come. Michael Jackson becomes a teenage werewolf, Jeff Goldblum—The Fly, David Bowie—a New Wave vampire, and Matthew Barney—a well-groomed Satyr. As in all of Edmier’s work, one can find familiar identities and structures reshaped and transformed. 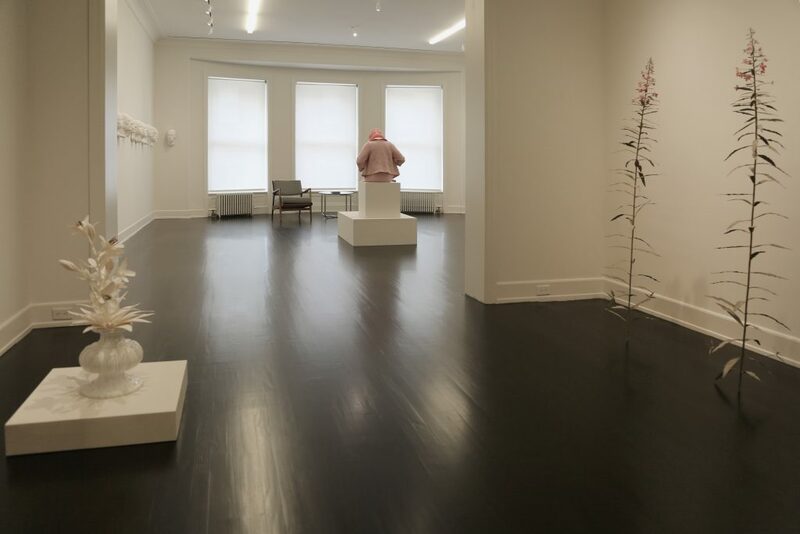 Keith Edmier, Mother Mold, Installation view, Petzel, 2017. Courtesy of the artist and Petzel, New York.